These kids I live with just don't like to eat their veggies. It's disheartening. Add to the fact that I get a HUGE box of fresh vegetables every week, and I feel like I am in a constant uphill battle to get the veggies consumed by humans before they are consumed by rot. It puts me in a real pickle. When I unpacked the box this week, and saw that there were 6 giant cucumbers, I may have hung my head and sighed out loud. I know, I'm letting a gourd relative get me down. I'm not proud of my little vegetable depression, it's just a fact. My kids really don't do well with raw veggies, and as far as I know, there aren't a ton of ways to cook a cucumber. I'm doing my best, but I just don't think its feasible for me to eat 6 cucumbers this week. So, when a gal is faced with too many of a particular veggie, she finds a way (as usual) to put off eating it until later. In the case of cucumbers, that means turning them into pickles. I decided to go with bread-and-butter pickles, since those happen to be my favorite. Besides, if we are going to be cutting back on meat around here, we are going to need some flavorful alternatives. And these are nothing if not flavorful. Are you wondering why they are called "bread and butter" pickles? Well, keep wondering. I can't figure it out. Even Wikipedia lets me down this time. While doing my research, I did accidentally read about "Kool-Aid Pickles" which are made by soaking the cucumber in brine and Kool-Aid. Wha??? I guess I should withhold judgement. If I get a bunch of more pickles in the next box, I may well end up trying them out. Desperate times call for desperate measures. Ummm, let's get back to our bread and butter pickles. Before we go and do anything desperate. These pickles are made by slicing the cucumber before you pickle it. This is helpful in getting the largest volume of pickles into your jars. (and some people around here are running out of pantry space to fit all the jars of jams and pickles and fruit). They are delicious on their own, but they have enough flavor to really stand out on a burger or sandwich. Do note, however, that you need to let the cucumbers sit and soak in salt for a spell. Make sure to do this ahead, and that you have time to finish you pickling afterwards. 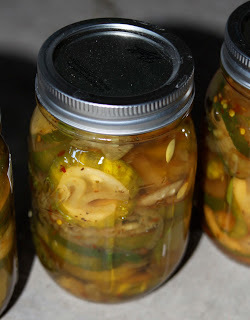 There are tons of Bread and Butter Pickle recipes out there. This is the one that I chose. cucumbers (I used 6 large; you can use how many you like. I ended up with 3 pints of pickles). Slice the cucumber and onion and place in a large bowl. Toss with the salt so that it is evenly distributed. Cover the vegetables with a tea towel (not a thick terrycloth dishtowel) and cover it all with an inch or so of ice cubes. Place in the refrigerator for 3-4 hours. At the end of the 3-4 hours, take it out and dispose of the ice. Rinse the vegetables twice. You will notice that the cucumbers already feel more pickle-ish. If you are going to store the pickles outside of the fridge, it's now time to sterilize your jars and get your water hot for the processing. If you promise to eat them all up in the next few weeks, you can just make sure your jars are squeaky clean. In a big pot, combine the vinegars and all of the spices. Bring it to a boil. Add the cucumbers and onions, and bring it to a boil again. As soon as it comes to a boil again, you can start packing the jars. Use a canning funnel if you have one, and smoosh as many cucumber slices as you can in each jar, up to an inch from the top. Then pour some of the hot syrup over it all, up to 1/2 inch from the rim. If you are planning to keep them in the fridge you are done! If not, read on!